A special type of polar orbit involves orbiting on or near the Earth's terminator. The "terminator" refers to the day-night divide on the Earth's surface. Satellite designers place their satellites in this type of orbit so that their solar panels will have nearly constant access to sunlight, thus providing nearly constant power to its electrical systems. The orbit plane of a sun-synchronous orbit is approximately 1 degree per day so that the satellite will always remain in synch with the sun, thus the name of the orbit. Earth is orbiting the Sun, and in doing so, changes the perspective at which the satellite sees the Sun. If the satellite's orbit plane did not shift by one degree per day, the satellite's solar panels would be pointed directly opposite the Sun in six months time, thus seriously depriving the satellite of power. The "RadarSat 2" satellite is in a sun-synchronous orbit. Notice how its orbit is not precisely oriented parallel to the Earth's terminator. 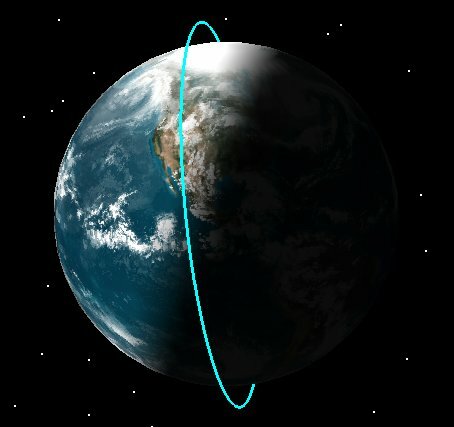 The orbit plane of Radarsat 2 changes (precesses) by nearly one degree per day to maintain synchronization with the Sun's light. This image courtesy of Analytical Graphics Inc. (AGI).